We are excited to announce that the October 14 WCCX will be held at famous Ludwig’s Corner Horse Show and Fairgrounds. This location has special history...utilized by Wissahickon Cross (including UCI races) for several years last held in 2009. We will incorporate many of the features of the Kelly Cline designed course with some 2018 modifications! Come on out and experience or relive that special PA cyclocross history! As you may remember this site is very spectator friendly, with the entire course being visible from the promanade hill. It also has easy to access of the PA Turnpike and will exceed the high level of racer expectations that come with a WCCX event. Don't miss the 7th year for this excellent event. Classic cyclocross course with two sets of barriers and variable terrain mostly grass, with some gravel. The 2.2 mile closed course is great for spectators. 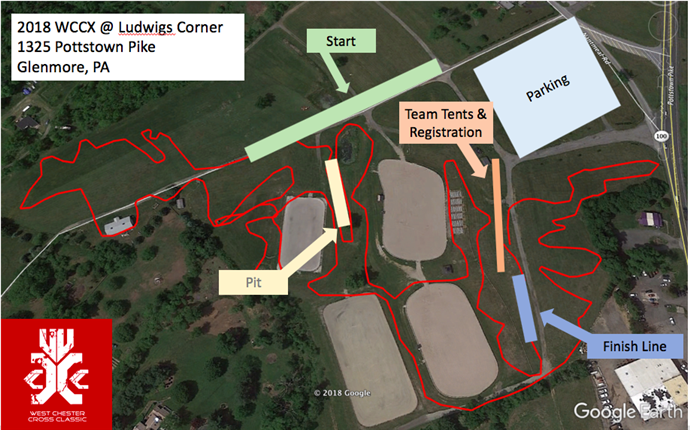 Course will be flowing and challenging, making use of natural run-ups, off cambers sections, and lots of cornering. While the venue is new for WCCX...the course will incorporate many of the challenging features from the past UCI venue with some extra bling supplied by "angry” Bob Reuther, local cross legend and long time advocate of local cycling...so you know it will be AWESOME! Special Notes: As in the past years, this race serves as a fund raiser local high school sports teams. · Pre-registration will be open on bikereg.com until October 12, 2018 11:00PM. · Yummy concessions will be available...so bring extra $$ and enjoy some great food. · Call-ups will only be awarded by promoter discretion. We will try to utilize current PACX series standings or 2017 final standings. The Promoter reserves the right to combine categories, change times, adjust course, etc.